Geer (Gerard) van Velde, like his equally famous brother Bram, originally trained as a painter and decorator in Lisse in the province of South Holland. The owner of the decorating business recognized the brothers’ talent and vocation and in 1925 he sponsored both of them financially to help them get started as creative artists, which allowed the Van Velde brothers to continue their artistic education in Paris. Van Velde originally worked in a figurative style, but was later to become one of the most important abstract-geometric painters of the \"Ecole de Paris\" with a characteristically restrained use of color with matte tints. 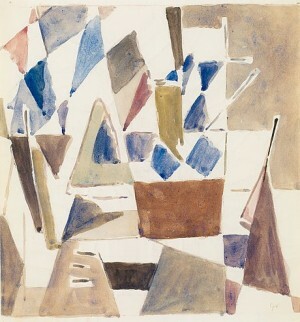 His friend Samuel Beckett helped him put on his first solo-exhibition in 1938, which was also the first exhibition held in Peggy Guggenheim’s gallery in Cork Street, London. His great breakthrough came immediately after the Second World War in 1946 when, through the intervention of Pierre Bonnard, he was given an exhibition in Galerie Maeght in Paris. 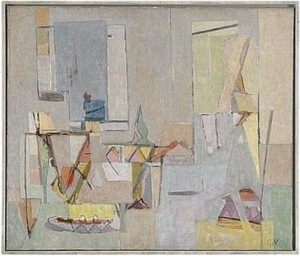 He was awarded first prize at the Menton Biennale in 1951. The work shown here is a particularly fine example of Van Velde’s painting from his early period, before the First World War.